I’ve noticed that lately I can’t be bothered with the same old nonsense I’ve once dealt with. Nonsense being a general term that can be stretched across the board. Plainly put, I’ve made some changes. I used to have a bad habit of getting upset fairly easily, 0 to 100 ,if you will. For those who know me personally might say that’s an understatement, but I’ve gotten so much better at managing my bad temper. Not with hot yoga or meditation, but mainly because I’ve learned a simple lesson. If I can’t change my situation, I must change my attitude. 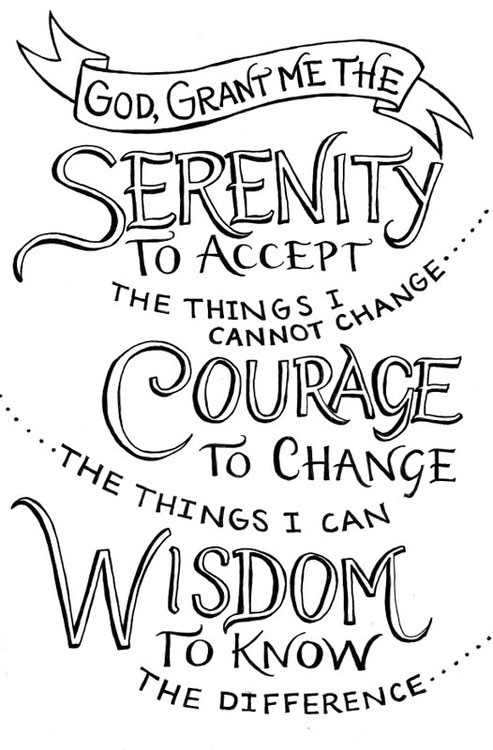 I’ve always been drawn to the serenity prayer because of my lack of patience and changing my attitude towards something I can’t control is right up that ally. I’ve learned how to let some things go, breathe, and move forward. It makes one hell of a difference I tell you. When you go from traffic and other stupid things literally ruining your whole day-to having a certified crappy day, BUT still feeling like the sun is shinning on you; your winning. It’s such a beautiful feeling and a relief. The way I used to be just kept me so weighed down, making it so easy to knock me off my path to happiness. It’s funny how simple it all sounds, but to someone like me- it was such a struggle. It felt like the most difficult thing to do. I felt like the world was picking on me. All I could ask the universe was, why me? I was looking for everything to be fair all the time and the world just doesn’t work that way. Now, I ask MYSELF- what do I want and what can I do about this situation? How can I change it-if at all possible? Once those questions are answered I act on it. If things can change I make an effort to do so. If it is out of my control, I let the forces that be handle it. There is nothing more I can do, so why stress it? It’s taken me some time to learn that lesson and to accept things for what they are; but trust me once you do, life gets a little easier.